New Liberal Democrat leader Nick Clegg has answered "no" when asked on BBC radio if he believed in God. The rapid-fire question and answer format on 5 Live meant the 40-year-old did not have the chance to elaborate. He later said he had "enormous respect for people who have religious faith", that his wife is Catholic and that his children are being brought up Catholic. Last month, former PM Tony Blair said he had not talked much about his faith for fear of being labelled a "nutter". The radio interview with Mr Clegg, MP for Sheffield Hallam, came ahead of a reshuffle of the Lib Dem frontbench team expected over the next few days. Asked whether he had ever taken illegal drugs, he replied: "I'm going to cast a veil over that. It's the one thing I agree with David Cameron on. I think politicians are entitled to a private life before they go into politics." And asked if he believed in God, he said: "No." In later comments to the BBC News website, Mr Clegg added: "I have enormous respect for people who have religious faith, I'm married to a Catholic and am committed to bringing my children up as Catholics. "However, I myself am not an active believer, but the last thing I would do when talking or thinking about religion is approach it with a closed heart or a closed mind." Mr Clegg was joined on his first day in the job by musician Brian Eno, whom he has brought in as an adviser on how to "reach out beyond Westminster to people who don't get a say in politics". Mr Clegg said: "I will fight for a society where everyone gets a fair chance in life, and no-one is condemned by the circumstances of their birth. "Education has got to be front and centre of Britain's agenda if we're going to make that happen. So I will raise funding for the poorest children to the levels in private schools. "And every family must be free from poverty, and feel they have a voice, and a stake, in Britain today." Mr Clegg added: "That requires a new kind of politics - a people's politics. If politics is going to solve the problems of people's everyday lives, we need to listen to people, and act on what they say." Later the Archbishop of Canterbury, Rowan Williams, reacted to Mr Clegg's declaration. Dr Williams told Radio 5 Live presenter Simon Mayo: "It matters less to me than to know they are honest and reliable and that what beliefs they have they hold sincerely. "This isn't a country where Christianity is imposed by law. It's a country with a nominally Christian majority. And that's good. "And whoever becomes prime minister has to understand that and work with it rather than against the grain of it." Last month, Mr Blair told the BBC his Christian faith had been "hugely important" to his premiership, but that he had been wary of discussing it in case he was labelled a "nutter". His ex-spokesman Alastair Campbell once told reporters: "We don't do God." Current Prime Minister Gordon Brown, the son of a church minister, is also a Christian who has spoken of his father's advice acting as his "moral compass". 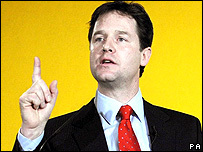 Mr Clegg, an MP since 2005, beat Chris Huhne to the Lib Dem leadership by 20,988 votes to 20,477 - a margin of just 511. Mr Clegg's election follows a two-month contest caused by the resignation of Sir Menzies Campbell. Vince: The one that got away?